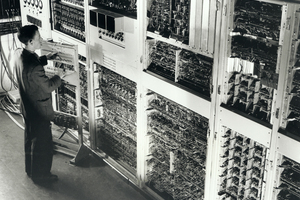 Originally called CSIR Mk 1, this huge computer was among the first five in the world and ran its first test program in 1949. Renamed CSIRAC, it was officially commissioned in 1951. It embodied many features novel at the time and was able to operate more than 1000 times faster than the best mechanical calculators. It was constructed by the Division of Radiophysics to the designs of Trevor Pearcey and Maston Beard.